All transactions are safe and secure with a reliable history in online purchasing behind each of our associates. 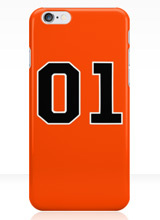 Buy the General Lee iPhone Case to own Dukes of Hazzard clothing and merchandise. Instead of a Hazzard County tee featuring the legendary General Lee car, this creative iPhone case design turns your phone into the good ol' boys car. It's perfect for fans of the TV show or car racing in general. The design depicts a side view of the General Lee. Whether you're a Duke boy or girl, this alternative to Dukes of Hazzard shirts will bring back fun memories of the good ol' boys. It's available on both iPhone and Samsung Galaxy cases. Pair it with a piece of Hazzard County clothing. In addition to the General Lee iPhone Case above, browse the Dukes of Hazzard Clothing Gallery for more apparel like men's and women's clothes, kids shirts or hoodies.